Continuing its focus on Scandinavian vanadium assets, Pursuit Minerals Limited (ASX:PUR) has applied for a Mineral Reservation covering the Ala Postojoki vanadium project in northern Finland. 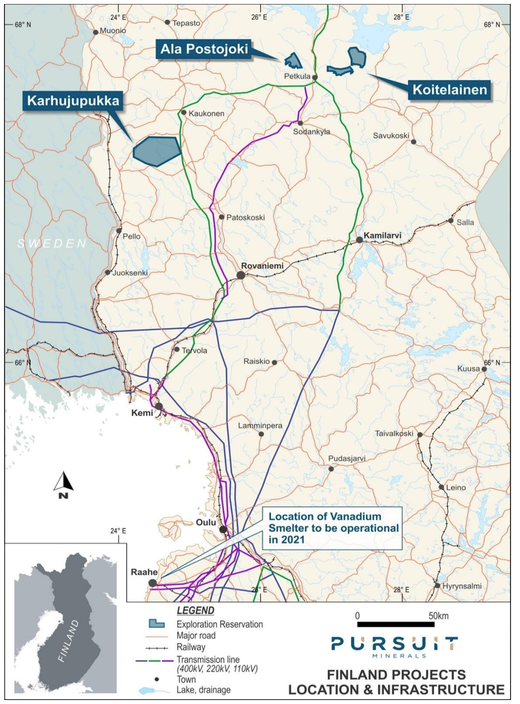 Being able to apply for this project on open ground demonstrated the opportunity to obtain highly prospective vanadium projects in a very cost-effective manner in Finland. This follows PUR being granted Exploration Tenements in Sweden and Project Reservations in Finland earlier this year, covering projects with historical deposits of vanadium and extensive confirmed areas of vanadium mineralisation. The Ala Postojoki project in Finland is close to the west of PUT’s Koitelainen vanadium project. 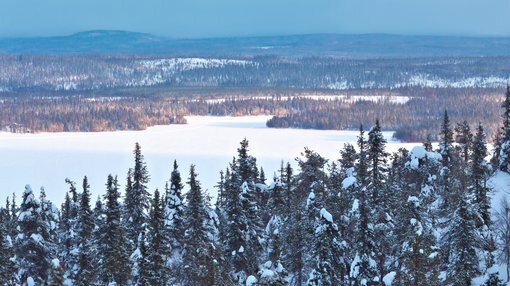 PUR’s application for one Mineral Reservation of 50 square kilometres covering the Ala Postojoiki vanadium project in northern Finland was accepted by the Mining Authority Unit of the Finnish Safety and Chemical Agency (TUKES), which is responsible for managing mining tenements in Finland. 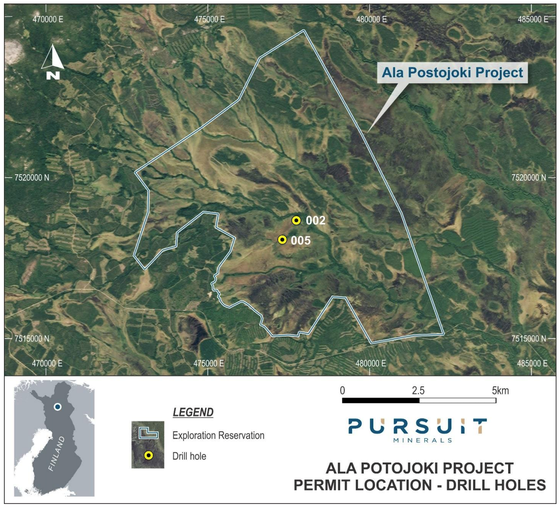 As there are no competing application, PUR expects the Ala Postojoki Mineral reservation to be confirmed within the next one to two months. When confirmed, the Mineral Reservation will allow the company to conduct non-ground disturbing exploration activities. The Ala Postojoki Mineral Reservation covers an intense magnetic anomaly with a 3.5 kilometre strike length. Two holes have previously been drilled into the source of the magnetic anomaly, confirming vanadium mineralisation within magnetic amphibole rock. The two historical holes are approximately 600m apart, indicating there is significant potential to extend the known vanadium mineralisation. PUR will re-sample the vanadium mineralisation from the two historical drill holes. This will involve assaying the whole rock to determine its vanadium content and also assaying a magnetic concentrate to determine the level of upgrading of the vanadium into a magnetic concentrate. The results from the historical sampling should be available in mid-November 2018. The results of resampling the historical drill holes will determine how follow up drilling will be targeted and undertaken. With Europe rapidly transforming its energy grid to renewable energy, which will require large increases in battery storage, PUR’s projects are ideally placed to participate in the energy revolution underway in Europe. PUR Managing Director Jeremy Read said, “Our experience with vanadium projects in Finland has been extremely positive and we have built a high-quality vanadium portfolio. “Our projects in Finland all have access to excellent infrastructure and cheap power and have the added advantage of being close to the world’s most advanced renewable energy market in Germany. “Europe is leading the way with transferring its power generation to renewable energy and with that change, energy storage is becoming increasingly important. Finland has previously produced up to 10% of the world’s vanadium and is currently rated the number one jurisdiction globally for developing mineral projects, while Sweden has a long mining history and culture and was the second country in the world where vanadium was recognised as a metal. With its Sweden and Finland projects very well positioned to take advantage of Scandinavia’s world-class infrastructure, cost effective power and stable legislative frameworks, Pursuit is looking to accelerate assessment and potential development of its quality vanadium portfolio.